In a report delayed because of the partial federal government shutdown, the Commerce Department said factory orders dropped off in November for the second month in a row. Broad declines in manufacturing demands included automobiles and military aircraft. New orders for commercial aircraft helped prevent the decline from being greater. A proxy for business investment declined for the second time in three months and lagged the year-to-year growth in overall orders. U.S. sales of motor vehicles slowed in January to the lowest annual rate since August 2017. The Bureau of Economic Analysis said car dealers had a pace of 16.6 million vehicle sales in January. That was down 5.1% from December and down 3% from January 2018. Since December, domestic auto sales declined the most, especially trucks. Year-to-year, the pace of imports fell the most, led by cars. Auto sales data reflect an important part of the manufacturing industry as well as a big-ticket consumer item. Consumer spending accounts for about two-thirds of the U.S. gross domestic product. In a sign of continued U.S. economic expansion, the ISM Non-manufacturing Index showed growth in January for the 108th month in a row. The survey-based report from the Institute for Supply Management indicated that the pace of expansion was slowing for the second month in a row. Purchasing managers surveyed expressed general optimism in overall business conditions but said they had concerns about repercussions from the 35-day government shutdown. The value of U.S. imports declined more than exports in December, narrowing the U.S. trade deficit 11.5% to $49.3 billion. The Bureau of Economic Analysis reported that exports fell by 0.6% from November. Imports dropped by 2.9%, in part reflecting declines in oil prices as well as a slowdown in consumer purchases, especially cell phones. Trade deficits count against overall economic growth, so the narrower gap suggests more growth. The four-week moving average for initial unemployment claims rose for the second week in a row and the fourth time in six weeks to its highest level since December. Still, the measure of worker demand was 36% below the 52-year average, another sign of a tight labor market that should encourage consumer spending. According to Labor Department data, jobless claims have been below the long-term average every week since the beginning of 2013. 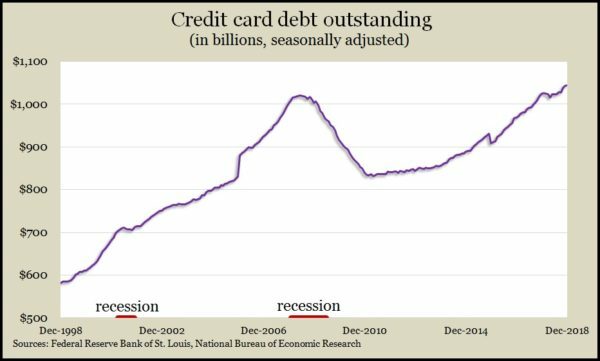 Total consumer debt outstanding grew at a 5% annual rate in December, declining from a 6.8% pace in November, the Federal Reserve reported. Financing for cars and student loans rose at a 6% rate in December. A measure of both consumer confidence and spending is the level of credit card debt, which rose at a 2% annual rate in December, slowing down from a pace of 5.6% in November and 11.6% in October.